Ah, AA. 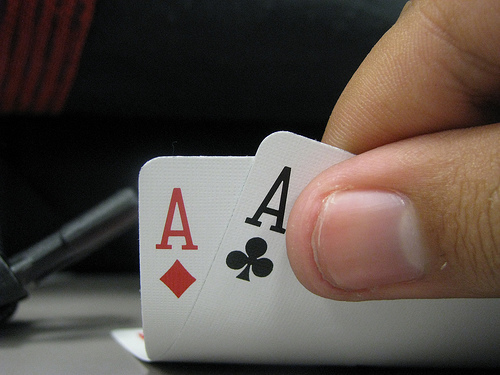 For those that aren’t hip on poker designations, that’s Ace-Ace — the best pocket pair you can possibly have. Chances are good that you will have AA at least once. It means that you are lined up for some good flops. it’s not unbeatable — no combination in poker really is when you really think about it. However, there is a certain way to play AA, and a certain way not to play AA. If you want our advice, you really need to make sure that you aren’t playing AA slowly. That’s the biggest mistake that you can make. Yes, it might mean that a weak table folds to you and that’s okay. If you’re in late position, you could end up dealing quite a few blinds. You have to make sure that you’re going to be fighting for all of the right reasons. You just have to focus on both poker position (late position is best), and you need to be betting HARD. This is not a time to limp in and hope that you’re going to win the pot. You need to make it clear that you have something that you’re working with. Sure, that might mean that others re-raise — welcome it. Poker isn’t a game where you can stay in the background forever. There are going to be some weaker players that just rush in even when they have garbage. There’s a time and a place for bingo players. When they’re making you money by playing bad pot odds? Take ’em for all they’re worth. If they’re going to make your life easy, then their chips should go into your stack. There’s times where you will have to fold AA but you’ll need to evaluate each flop as it comes. AA is a monster hand and it needs to be played as hard as possible. You can’t think that you’re going to slowly play that hand. It loses a lot of its power if you slowplay. The way you play AA is to be aggressive. Don’t worry that you’re going to lose. Go in knowing that you’re going to win. If you get 2 pair based on the flop, then you’re going to have the best pair that you can make — unless someone else has the other set of aces. It’s important to see how others are playing. If they just blindly call, then you know that you could clean up. If someone re-raises you, they might be convinced that they have a better hand than you. This is where studying the board just cannot be repeated enough. If there’s a flush draw on the board and you have no way of making that flush, you might want to fold and just let it go. Poker is tricky in terms of absolutes. You have to go by the situation rather than just hoping everything will line up perfectly each and every time you play. Adding in the element of people can make things really tricky. Good luck with your gameplay – the competition might be fiercer than you expect!